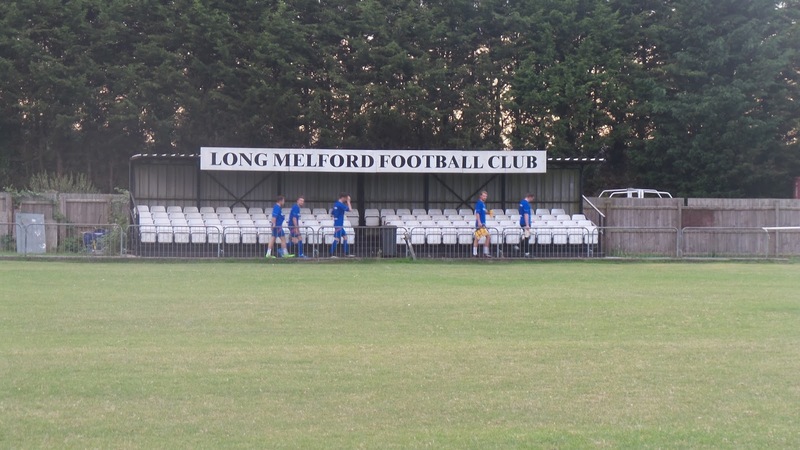 LONG MELFORD were founded in 1868, making them one of the oldest clubs in football. For the vast majority of their history, they played in local leagues such as the Suffolk & Border League. 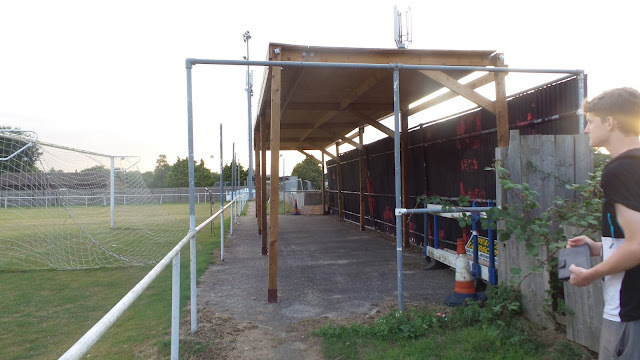 In 2002 they joined the Eastern Counties League at Division 1 level. Despite a 6th placed finish in their first season, they lingered in the bottom half for many seasons after that. 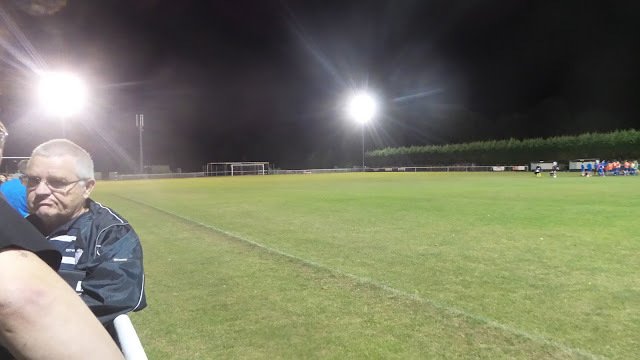 With their highest finish after that being 9th, it was somewhat of a surprise when they were league champions in 2014/15 - finishing 3 points clear of 2nd placed Swaffham Town and scoring 101 goals in the process. An extremely respectable 9th place was achieved in their first season and they have followed that up with a steady start this season, sitting in 13th place at the time of this blog. In the FA Cup, 2004/05 saw their best ever season as they reached the 2nd Qualifying Round. 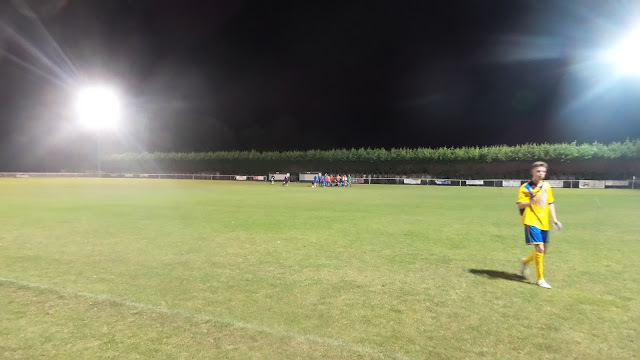 They beat Great Yarmouth Town, Woodbridge Town and Marlow before a 2-0 defeat to Yeading who would go on to win the Isthmian League and reach the FA Cup 3rd Round that season. 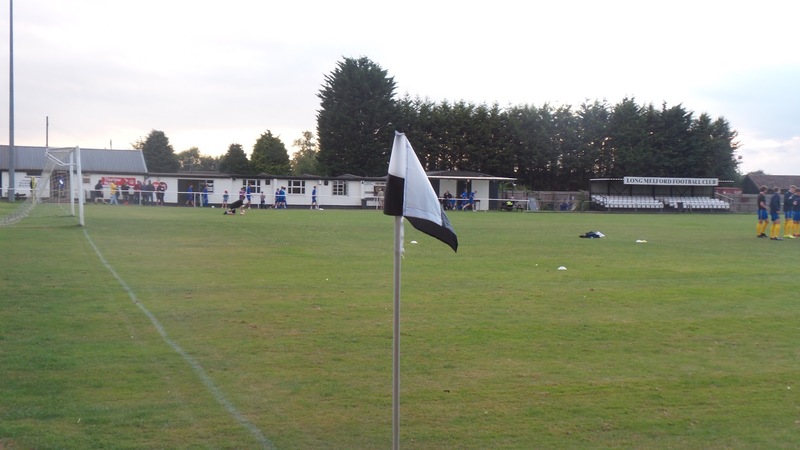 The same year also saw their best ever FA Vase run, losing in the 3rd Round against Brook House. Numerous local honours have been won, most notably the Suffolk Senior Cup on 8 occasions. The 1887/88 season saw them challenge Ipswich Town to a friendly, with the giants refusing as they didn't want to risk 'losing to a little village side'. They had no choice in the county cup later that year, as they were beaten 2-1 in the final. 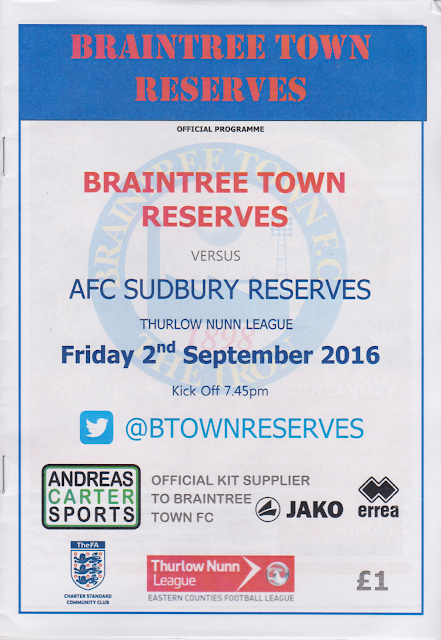 I'd planned to go to this match a couple of weeks ago, as I hadn't seen my Braintree supporting mates for a while. 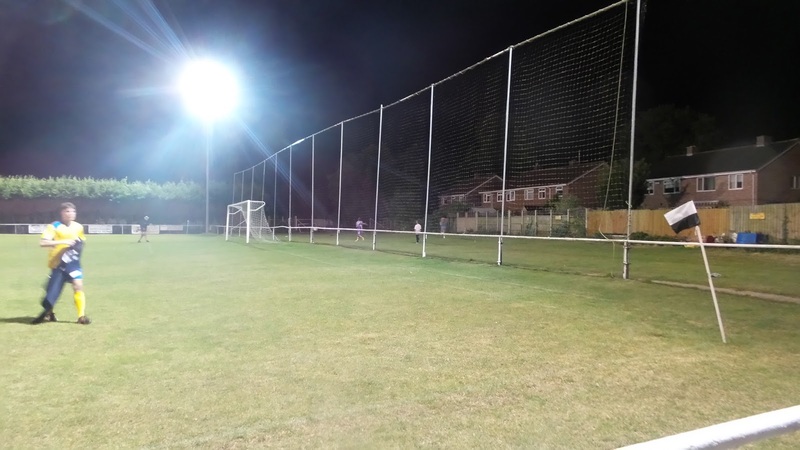 The Eastern Counties League would again provide the entertainment, though I'd have preferred a first team game, but choice was limited on this Friday night. 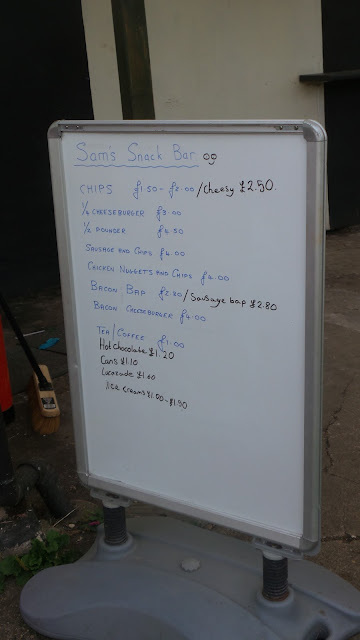 It worked out pretty well, with both my other main hopping pals busy, as although I enjoy going to games with these lads, it does work out a lot more expensive due to the distance involved getting to the meeting point. As I'd need to eat beforehand, I'd be making my usual pitstop at Chelmsford before driving on. It was another easy day for me at work, and after 6 hours done, I was out at 11am. I went home and had a bath, as well as catching up on various jobs that needed doing, before leaving at 3.15. The original plan was to go via Chelmsford for dinner, but 30 minutes delay on the M25 put pay to that. Instead, I stopped off in Braintree at the Picture Palace Wetherspoons where I had Pomodoro Cod fillet and a pint of Thatchers Gold. It was a rare healthy meal for me, with it being under 500 calories and low fat. 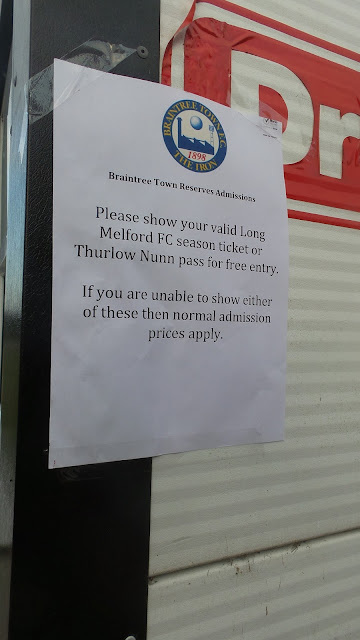 Thankfully Braintree is one of those rare towns that doesn't treat motorists like dirt, and I was able to get an hours free parking on a nearby Street. After my dinner I walked to B&M to get some diet Irn Bru and a Lion Bar. I left town at 6, picking up Dan, Maurice and Josh before driving to Long Melford and arriving at 7pm. 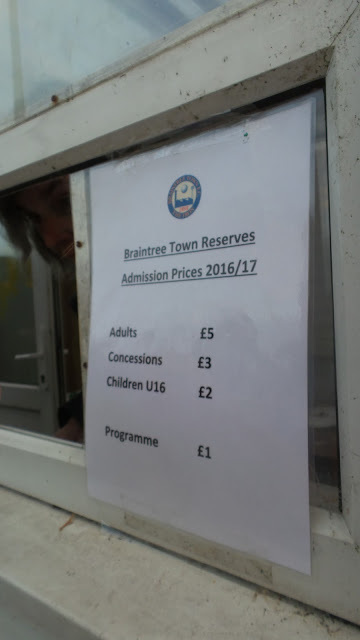 I paid £5 to get in, plus £1 for a reasonably decent programme. 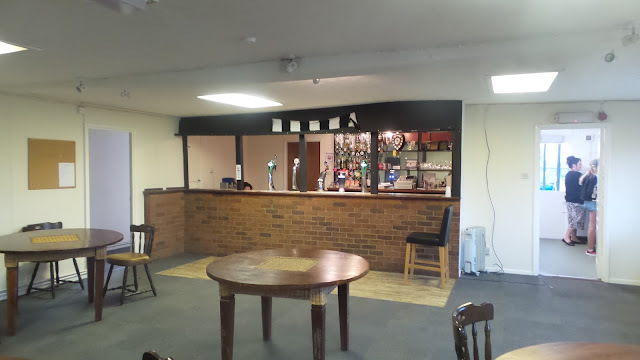 After getting some pictures of the ground I went and sat in the bar, although I didn't bother with a pint as they only did Strongbow. We had a chat with some other groundhoppers while we waited for the game to start. 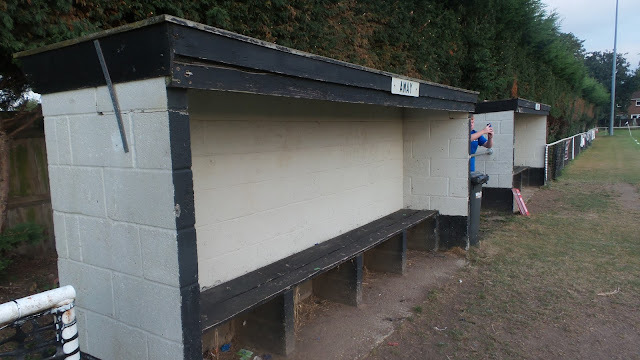 We took a seat in the stand for the game and although Sudbury dominated the opening stages it was Braintree who opened the scoring on 6 minutes. A decent through ball found Joe Jones who finished well past the visiting keeper. 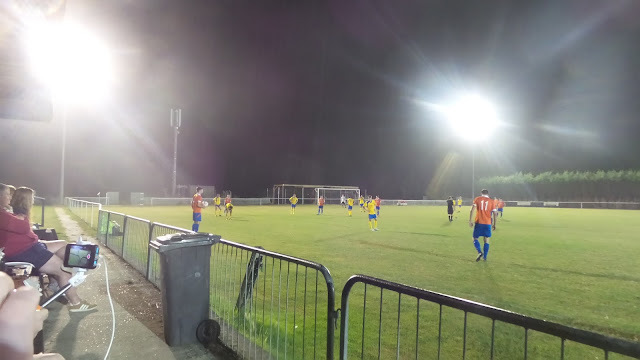 The game was pretty average, and half time came with Sudbury still edging proceedings. The same could be said for the second half, so it was some surprise when Braintree added a second during a good 5-minute spell. 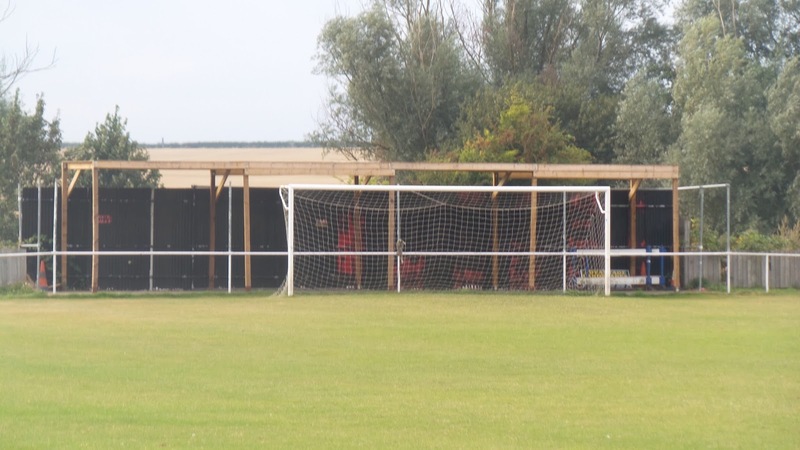 The ball was lobbed forward to around about the penalty spot and the Adam Fowles headed past the keeper. 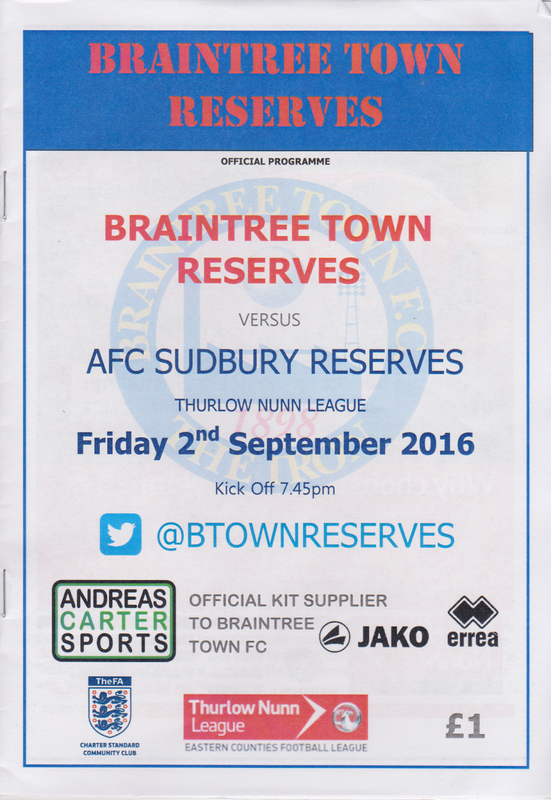 The second goal knocked the stuffing out of Sudbury, and the best of the remaining chances fell to Braintree. So maybe their side rode their luck a bit, but my 3 Braintree supporting pals were happy. They'd been good company for the night but it was now time to go home. The route that I had to take back to Braintree was right cross country , with winding and narrow roads. Eventually, I'd dropped everyone off at 10.30 and could make my way home. A couple of road closures added 20 minutes and plenty of miles to my journey. After stopping for fuel, I got home at 12.15, watching TV for a couple of hours before going to sleep. 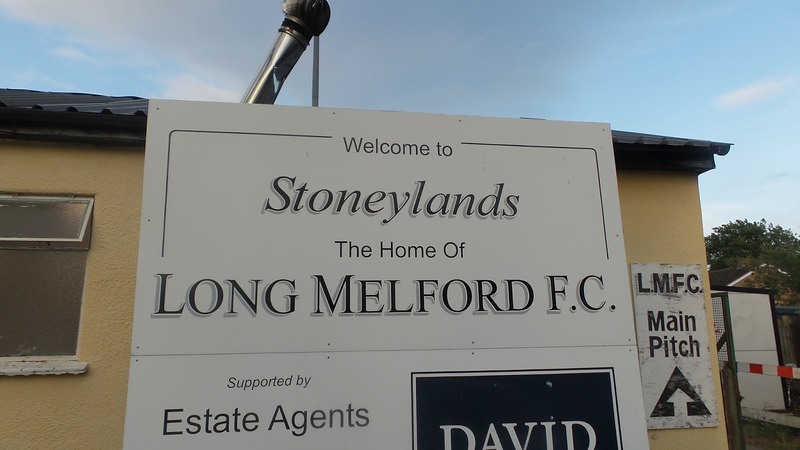 STONEYLANDS is a basic but well kept ground for the level they play at. A seated stand holds just over 100, whilst there is cover for a further 50 behind the goal. The rest is open hard standing. 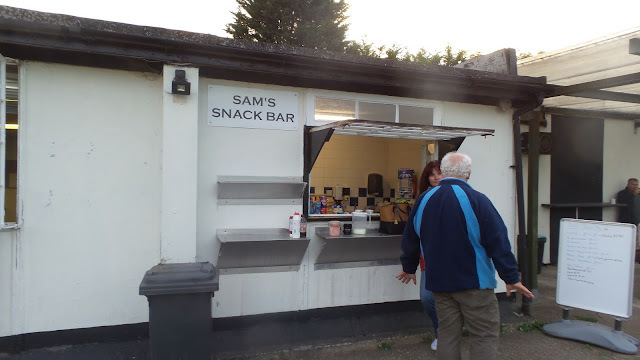 There is a standard bar and a decent tea bar too. 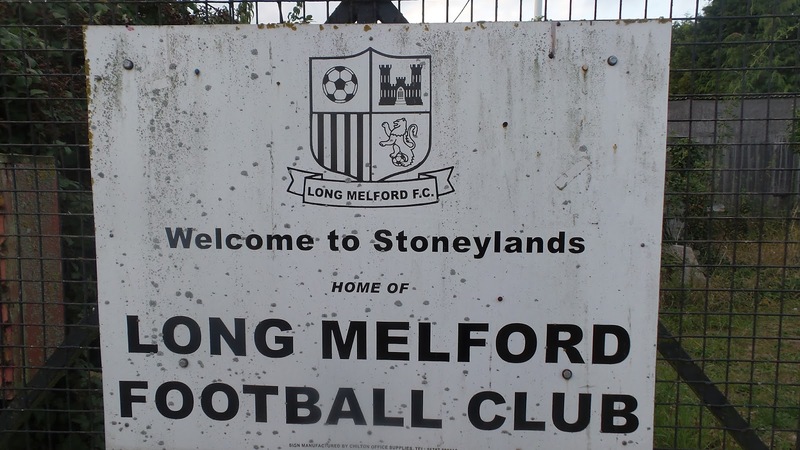 The ground is fairly close to the village of Long Melford, though I didn't check out what was there.